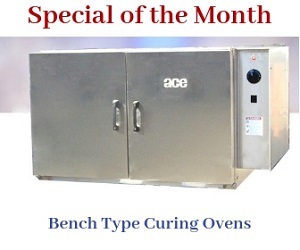 The ACE Model 4128-RT burn off oven guarantees complete and efficient cleaning of parts. Metal components can be completely cleaned for reuse with the help of this oven. The hybrid design, and high end process control features make it one of the most user-friendly pyrolysis systems available. The optional One Touch Control (OTC) system enables effective operation of all oven functions and features. Insulating resin from electric alternators. Insulating resin from copper windings. Paint and coatings on hooks, racks, and metal fixtures. Oil and grease from blocks, heads, and other metallic components. The technical details of the oven are stated in the following specification tables for customers to understand more about the product. Volume Over Cart 124 CU. FT.
1 Top Mount Pressure Relief Hatch 9.62 SQ. FT. The oven is manufactured in compliance to NFPA and FM (optional) as well as UL, and ISO specifications in order to guarantee safe and reliable operation.